Friends of the Earth International are presenting a new publication from their Forests and Biodiversity Program. The brochure, “rejecting Financialization of Nature”, explains in a simple way how financialzation works using examples from different countries. It puts forward a strong position on financialization to raise awareness in the public and should be a useful tool for those lobbying at international and national levels. Spanish and French language editions are available from Friends of the Earth International directly. 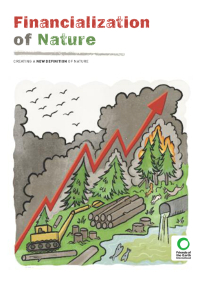 Friends of the Earth International is also publishing materials to support its work about climate finance at the national and international levels, at the UN and UNFCCC, backing Indigenous Peoples and local communities rights to end deforestation and forest degradation. Drawing together these pieces of work, Isaac Rojas has written an article for The Ecologist magazine: “Local communities, not global financiers, are the best forest managers”.